Matt Lojeski broke out of a slump in the title game of the Rainbow Classic on Saturday. Over a three-night span, Riley Wallace watched the Hawaii basketball team hit a growth spurt. The Rainbow Warriors endured some growing pains during the Outrigger Hotels Rainbow Classic. But they ultimately emerged from the tournament with a championship and a greater sense of identity. "These guys are young college kids having fun," Wallace said. "They're kids and they're growing and becoming young men now. And I like that about them." With the thrill of reclaiming the tournament title still fresh, the next step for the Rainbows (8-4) will be to maintain their momentum when they return to the Stan Sheriff Center on Thursday for a nonconference game against Tennessee-Martin. They then head on the road after New Year's to begin the Western Athletic Conference season at New Mexico State and Louisiana Tech next week. 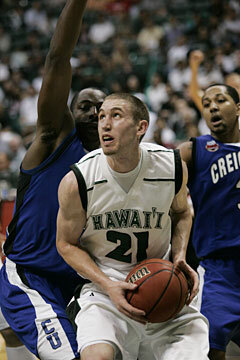 "We can't let it get to us too much because we do have a game coming up on Thursday," UH guard Matt Gibson said. "But this was a good game for us." The Rainbows entered last week's play at 5-4 and continued their development in running their winning streak to four straight heading into Thursday's game and the looming WAC schedule. "I think we try to push them mentally -- the fans, the press, me, the coaches, everybody else -- to be good immediately," Wallace said, "and it's a team that looks like they just had to learn and grow and understand what Rainbow basketball is all about and what the fans expect out of us." The Rainbows opened the Rainbow Classic by running out to big leads in their first two games but needed to hold off late rallies to advance to the final. They then put together a solid all-around performance, led by Matt Lojeski's 33-point explosion, to score a resounding 76-60 win over a Creighton team expected to contend for the title in a tough Missouri Valley Conference. "I couldn't have done it without them, " Lojeski said of his teammates. "They set me up, they got me open, they passed me the ball. It was just a team effort. "It just came to me," he said. "It was just within the flow of the offense. I just hit shots and I didn't feel like I forced that many shots." Though their late-game struggles in the first two rounds created some angst, Wallace praised the Rainbows' execution prior to those stretches, which has also made his job a bit easier. "They're running stuff on the floor now where you don't have to call it any more," he said. "They're feeling each other, they can get in an offense and they know their offense." Their play also impressed other coaches in the tournament. "I told (UH associate coach) Jackson (Wheeler), the two years I came over here with UTEP I thought Hawaii was more talented than this basketball team, but I think this is a better basketball team," Nebraska coach Doc Sadler said after the Cornhuskers' semifinal loss to UH. "I believe that. They share the basketball, they've got good shooters and they know their roles. "I think people need to give the team more credit for getting those leads than losing those leads." As the UH players savored the tournament title, they also took satisfaction in giving Wallace his eighth Rainbow Classic championship in his last year as coach. "There's not enough words I can say about Coach," Gibson said. "He's done a lot for me and he's still doing a lot for me. It feels good and I'm glad at least I can repay him this little bit. Anything I can do, I'll do. It's a good present, a good Merry Christmas."